Before we discuss the “How To’s” Let’s talk about Garage Door Safety! First a quick note to say garage doors and openers are not toys to be ridden or pulled and or played with. They can in fact kill you. According to reports received by the U.S. Consumer Product Safety Commission (CPSC), approximately 60 children between the ages of 2 and 14 have been trapped and killed under automatic garage doors since March 1982. This is approximately 4 such deaths per year. Other children have suffered brain damage or serious injuries when the closing door contacted them, and failed to stop and reverse its direction. CPSC urges consumers to check the condition and operation of their garage door and the opener. A properly operating garage door will be “balanced.” This means that the door will stay in place when stopped in any partially opened position. 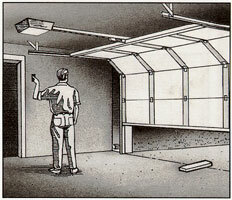 A severely unbalanced garage door could unexpectedly crash to the floor possibly striking someone under the open door. Its imperative to TEACH YOUR CHILDREN ABOUT GARAGE DOOR SAFETY!!!!! Do not allow children to play or hang on your garage door. You should discuss garage door safety with your children. 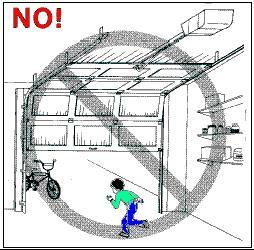 Be sure to show your children that they should never stand or walk under a moving garage door. Make sure they understand the danger of being trapped under the door. Never let children play with or use the wall button control. Do not let children play with or use remote controls. You should always keep remote controls out of the reach of children. Finally, never assume the garage door is always clear when you close it. If kids have been outside playing near the door take second and inspect to make sure everything is clear before hitting the button to close it. Once again stay safe with your garage doors. See us on our next post to tell you how to lubricate you garage door. Garage Door Operation 101 – a homeowner’s guide to the garage door and how it works. One of the most overlooked “appliances” in your home is the garage door. You press a button. It goes up. It goes down. Simple, right? Not really. Like every other mechanical device you own – your cars, your kitchen and laundry appliances and your heating and cooling systems – your garage door and its operating system needs to be properly adjusted and regularly maintained in order to function correctly. Never take a garage door system for granted; always use extreme caution when working on it or near it. Make sure that children understand that the garage door and the garage door opener are not toys. Never let children play with the door or its operating system.